New project made with Basswood,where Basswood is showing curly figure? Is figure normal? Does it happen often? All my previous encounters with Basswood as drawer sides or light weight trays in chests have always used boring straight grain basswood, and never seen figure like this. Found maple scrap long enough for deck and handle, and decided it was time to use some 5/8” thick Basswood given to me by a sawyer as bonus for buying a large pile of hardwood. Nice part about basswood is very light weight, while the center/handle is using hard maple for strength. The rough cut basswood board was stained, ugly, and super dry as it had been stored in AZ for 20+ years. 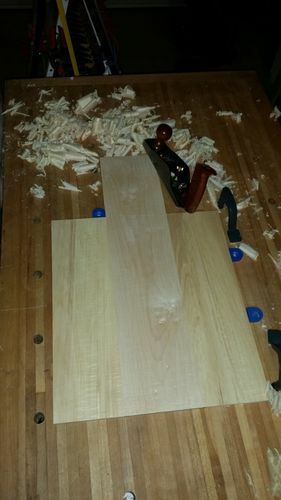 After gluing/scraping/planing the boards, notice that the maple has some figure, But was shocked to see basswood with figure too? Would like to know if others have seen figured basswood? Or could the wood have been miss labeled? Curly figure in basswood would be uncommon for sure. I think the the wood was mis-labeled and that all pieces are maple. The grain looks pretty strong to be basswood. Curly figure in maple is less uncommon. However it could be basswood. What we call soft maple around here, the stuff you buy in the big box stores, that can occasionally have some flame in it. It is a fast growth maple, and not dense and hard like hard maple. I think what you believe is basswood might be soft maple. I also found a piece of aspen in a Lowes once that was just loaded with a quilted pattern. Bought it, although all I have used a bit of it for were drawer fronts on a bandsaw jewelry box. It was also light, soft and had flame and quilt. Looked nice, and as long as I didn’t stain it, took a finish OK. So I would guess soft maple or aspen. I suspect that that wood is not basswood. It’s known for lack of figure, which is why it is used for carving. That is not to say that a board can’t have some figure. I have, however seen (and have) some pine that has a figure you wouldn’t believe. All kinds of strange out there in the woods. Thanks for comments! Confirm my suspicions that figure in basswood is rare. @Tennessee: Maple, interesting. This wood is less dense and softer than any soft Maple I have ever used? Harvested from Minnesota/Wisconsin area. Few samples I have are ~11” wide, and it was ~55% of trunk width. Sap wood has yellow streaking, while heartwood is creamy off white color by comparison. Measured density for 6 ft long board is 450kg/m3 (~28 lb/ft3), with moisture < 10%. So might be more like 480-500 kg/m3 for comparison to density tables listed as 12% or 20% moisture content. Can easily dent wood with finger nail, like most basswood I have seen. Similar to alder regarding dent-ability. Harder to dent than BORG 1” yellow pine trim boards, and redwood samples I have. 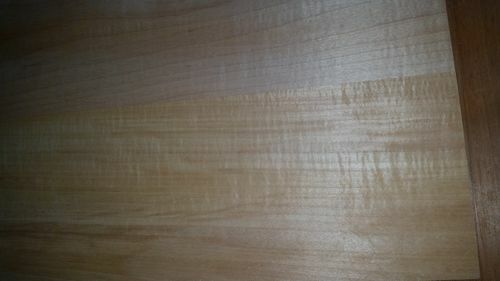 Colors are reverse of Basswood, looks more like cottonwood, except has fine grain/pores like silver maple, but growth rings are much tighter – like elm, striped maple, or big toothed Aspen. Does have faint odor from edge when freshly machined? Have to stick your nose directly at the cut edge to smell it. Hard to explain: has a musty/dirty almost locker room smell? Wife says it is horrible cross between ammonia and musty sweat sock? Since maple does not usually have an odor (unless this is some weird swamp grown maple), this leans my thoughts towards stinky American elm or cottonwood as candidates. The end grain is not like any of the elm varieties in database; So this points towards cottonwood as most likely answer, (with soft swamp maple as distant alternative)? This would be first time I worked with cottonwood, Does cottonwood have this odor when dry, and commonly show figure? Cottonwood has a little odor. “Cat piss” was what my dad called it, which matches the ammonia your wife called out. I never noticed it, but I had allergies when we were cutting down the one cottonwood I’ve ever dealt with. Have you checked the poplar, cottonwood, aspen, what's what? page at the wood database? That might offer more help in distinguishing what you’ve got.